Last night, Stephen Colbert suggested that the growing divide between rich and poor in America had a simple solution: the rich should just create their own nation. He suggested the names "America-plus" or "Golfistan," but Mr. Colbert failed to offer a map of this potential new country. So we thought we'd take a crack at it. Those teeny red blotches on the map above... those are America's richest counties. Link them together, and you have a good approximation of Golfistan. 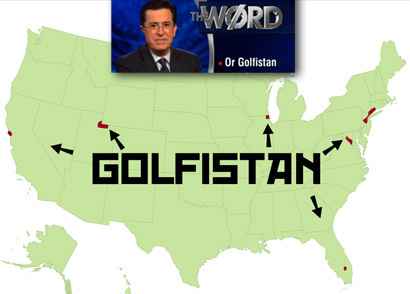 For those of you who don't live in Golfistan, it's time to start digging tunnels, so you can sneak into the new nation and get jobs as undocumented workers—manicuring the vast border-to-border putting greens of Golfistan. Watch Colbert's tirade here.